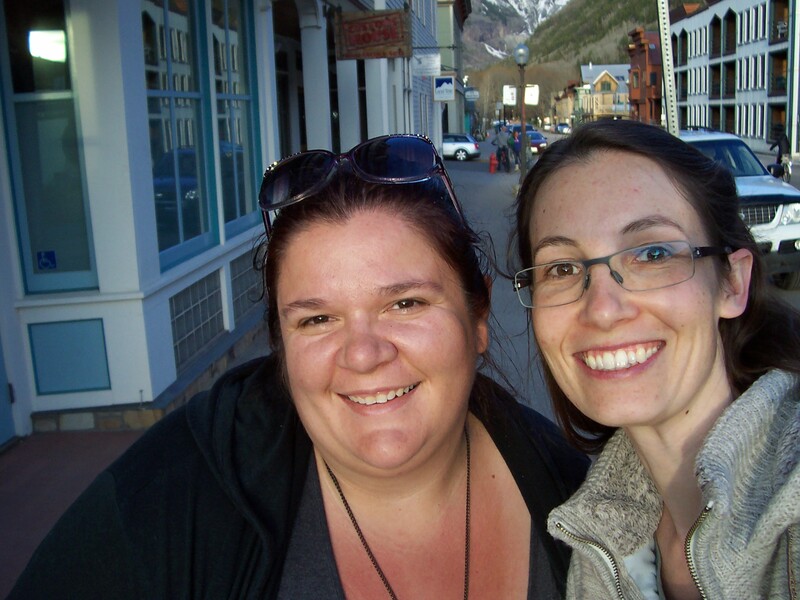 This summer, on Saturday, August 13, in Silverton, Colorado, my friend and fellow writer Blair Runion and I will be hosting a writers conference. The event is called the Writers and Scribblers Literary Retreat and you can find the Facebook page here. Tickets are $25.00 and include lunch and free beverage of choice (coffee/lemonade/iced tea) all day. We’ve got an AMAZING number of presenters and panelists lined up already, and I have no doubt our lit retreat will be a whole lotta Hell Yeah. In preparation to host our own event, Blair and I attended the Telluride Literary Festival this year, on May 20, 21, and 22. I drank lots of coffee and talked nonstop. Blair wore a dress covered in skull and crossbone emblems. She introduced me to poets I’d never heard of before, which she played on her phone. We listened to a lot of live poetry at the event we’d come to attend, but then we listened to even more poems on Blair’s phone. It was a great weekend for a number of reasons, but the biggest was simply the pleasure of Blair’s company. 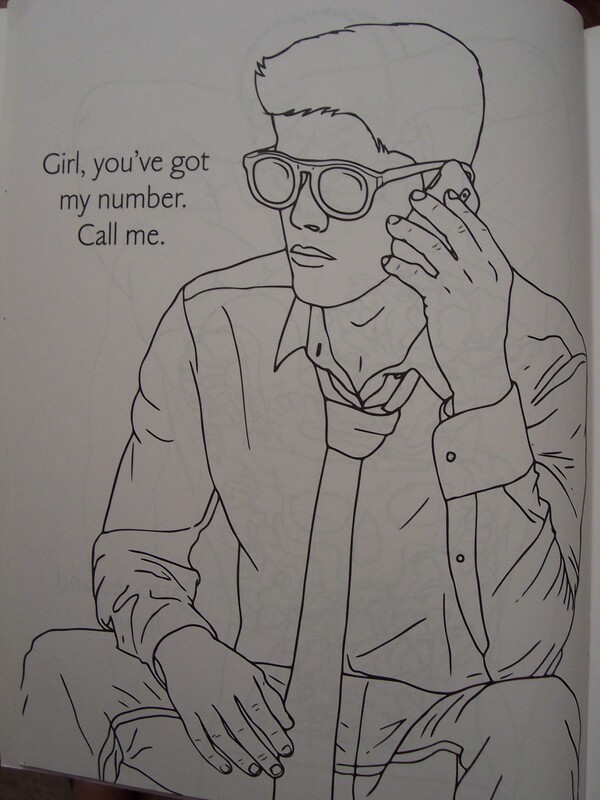 Plus, she bought me this Hot Dudes Coloring Book, which she found at Between the Covers, the local bookstore in Telluride, and this cemented her position as Queen of Goofball Shopping Adventures. 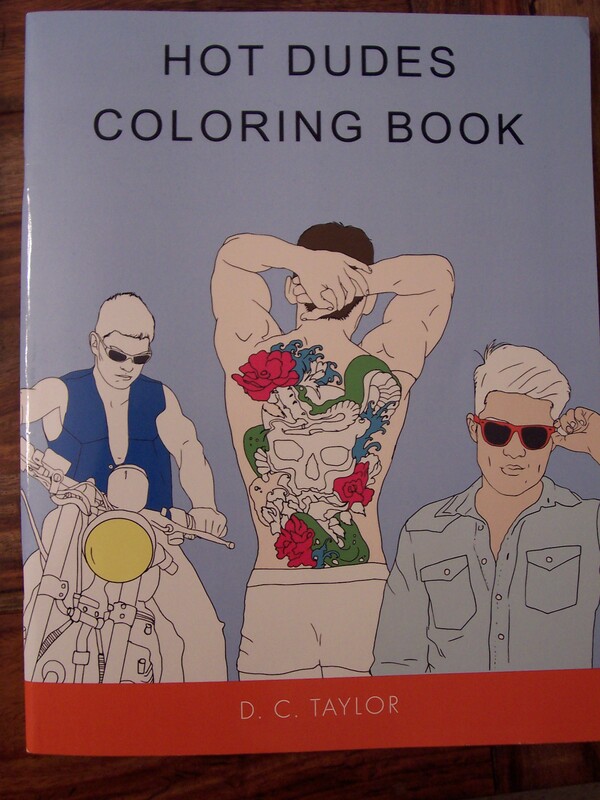 So in case any of my blog readers have been craving some stud-muffin coloring time, this book will satisfy. I was so incredibly touched when Blair picked this out for me and had the author sign it. 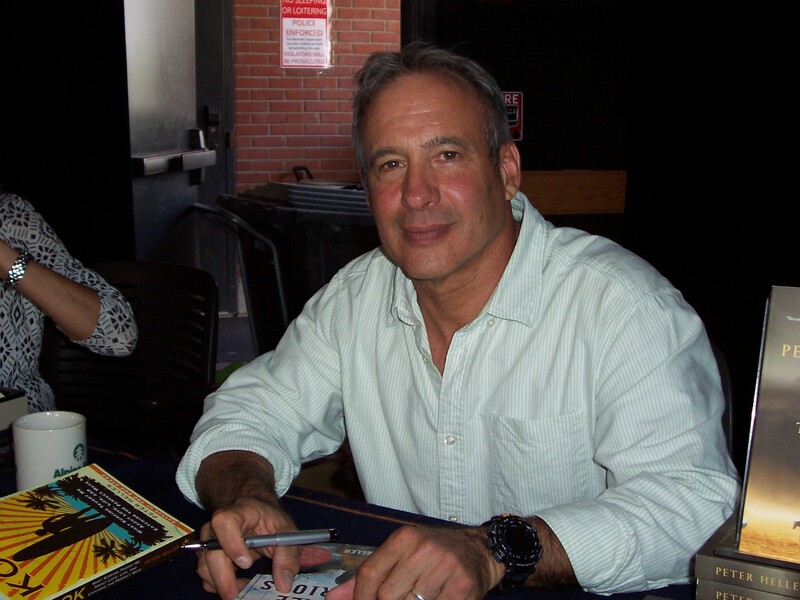 Peter Heller was the keynote speaker at the Telluride Literary Festival this year, and in a funny twist of fate, I overheard Mr. Heller tell some folks that he met the stars of The Whale Warriors the same way I did — at the Telluride Film Festival several years ago. That was why he later contracted to write this book about them, because of seeing the same presentation I did at that festival. Small world. I thought I’d fall in love with this book, because Peter Heller is such an amazing human being. To listen to him speak, and to be around him, is to be in the presence of someone who is humble and kind, always looking for the joy in a situation, open to anything, or anyone, a man who laughs easily and often — and he knows his stuff, through and through. Peter Heller is incredibly smart, and he’s a truly wonderful guy, in every way that a person can be wonderful. 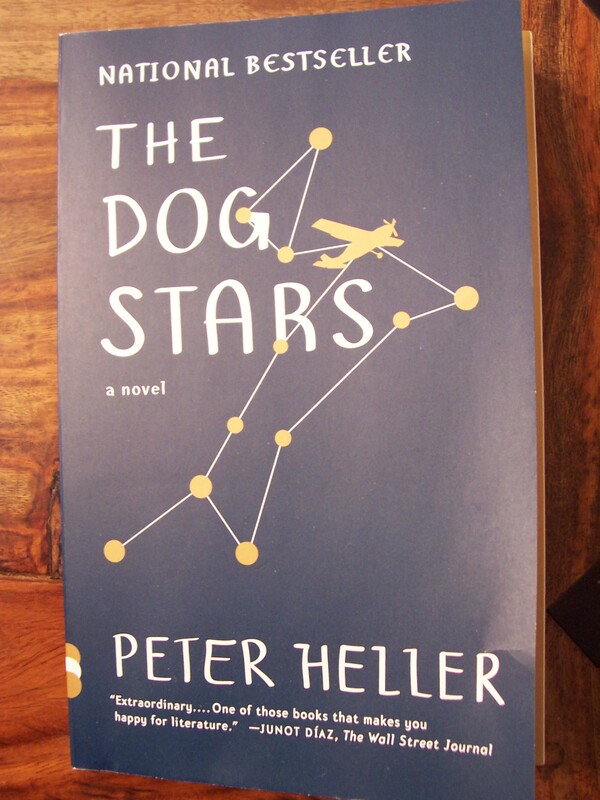 I possess a deep admiration for Peter Heller, but I ended up not falling in love with his first novel. You can find my review of the book here, if you’d like to hear more about why this book was a struggle for me. Mr. Heller’s second novel, The Painter, is also out now — and both of these books are currently being made into movies. 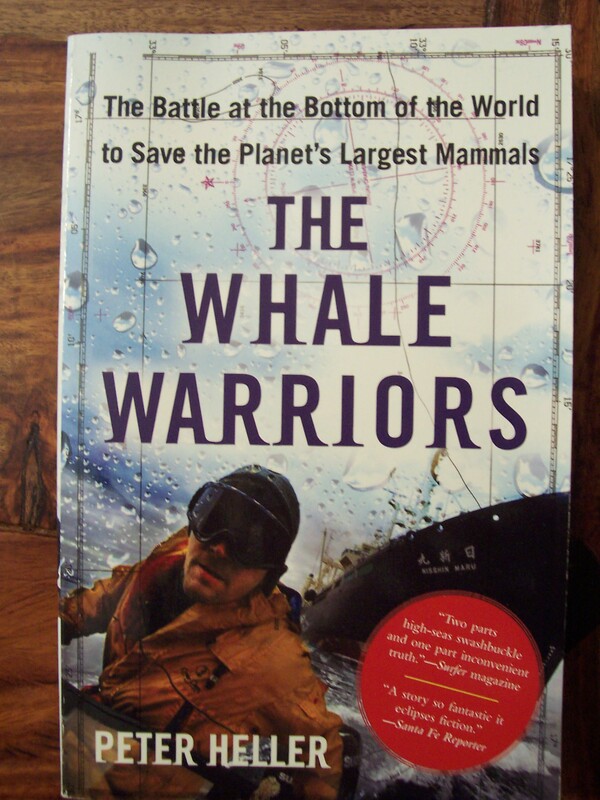 I’ll be reading The Whale Warriors soon — at some point in the next few weeks. Since I am working on my mer novel right now (a YA fantasy set in the ocean, starring merpeople) The Whale Warriors will be useful as research as well as for the pleasure of excellent nonfiction. On the far left is a woman I don’t know — I think she was one of the organizers for this event. (Like me this August, since I don’t plan to present, but just do all the behind-the-scenes work instead.) 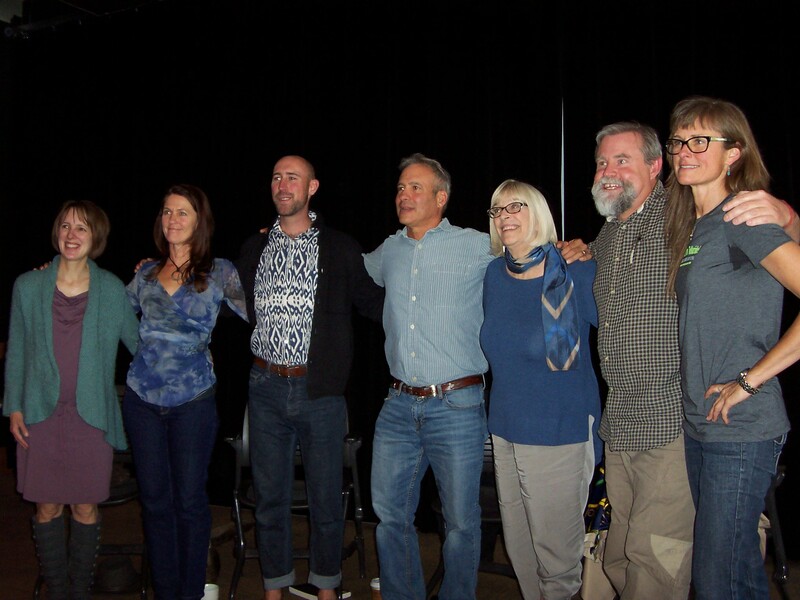 The second woman from left is Amy Irvine, whose memoir Trespass: Living at the Edge of the Promised Land won both the Orion Book Award and the Colorado Book Award. For someone to win the Orion Book Award gives me a such a huge WOW factor. It’s like learning someone won the Pushcart or the Booker. Just WOW. Because I adore Orion so much, so very much, and here is a writer Orion loves too. I was really impressed with Ms. Irvine at this event, and I’ve been reading articles about her online, including other pieces she’s written for Orion. I’ll be reading Trespass this summer as well. Next to Ms. Irvine is Alec Jacobsen, the Executive Director for the San Juan Independent and the former Editor in Chief of ArtsRiot.com. That guy’s brain is amazing. I think he has an I.Q. of three million. I enjoyed his comments immensely. Next to Mr. Jacobsen is Peter Heller. Then this fantastic woman named Judy Muller, who is a professor of journalism, an NPR contributor, and the author of Emus Loose in Egnar: Big Stories from Small Towns. Ms. Muller made me laugh, made me tear up, made me nod my head in appreciation. She is freaking awesome. Next to Ms. Muller is the zany and irrepressibly delightful author Craig Childs. Who has the most perfect surname ever — Childs — because he is like the body of a man stuffed with hundreds and hundreds of kids — kids of all sizes — all of them rambunctious and bouncing off the walls and thinking, constantly thinking. This is the second time I’ve attended an event with Craig Childs and I love him. He possesses the madness gene of humanity, plus several extra madness genes that I’m sure his parents didn’t realize they’d passed onto him. And on the far right, beside Mr. Childs, is a woman named Chesonis, who is co-owner of Between the Covers Bookstore, the former Art Director at Telluride Magazine and co-designer of Telluride Rocks 3rd Edition. She also helped organize and put on the Telluride Literary Festival, and Chesonis even helped Blair and I score tickets to the Literary Burlesque Saturday night. She is just amazeballs and super fun, and Between the Covers is a lot like Maria’s Bookshop (here in Durango), with wooden shelves and hardwood floors and that wonderful indie bookstore vibe. 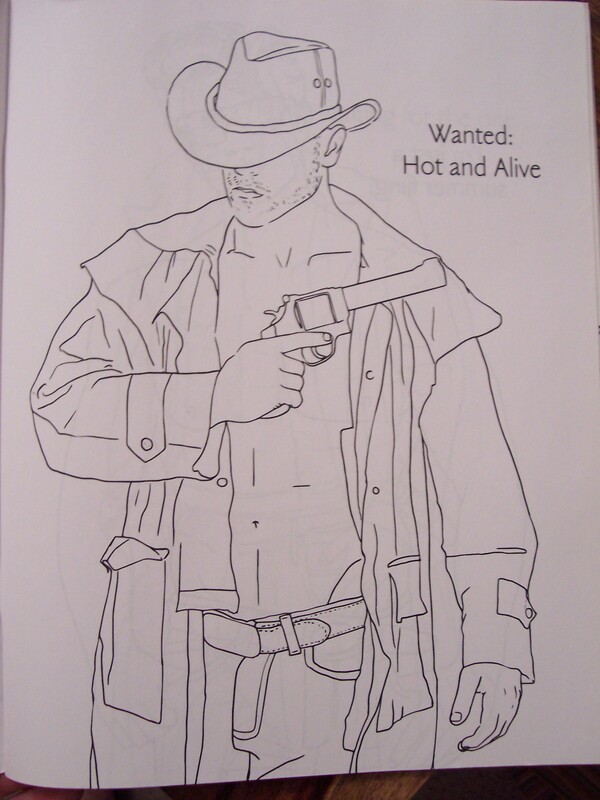 Copies of the Hot Dudes Coloring Book can be found there. Operators are standing by to take your orders NOW. 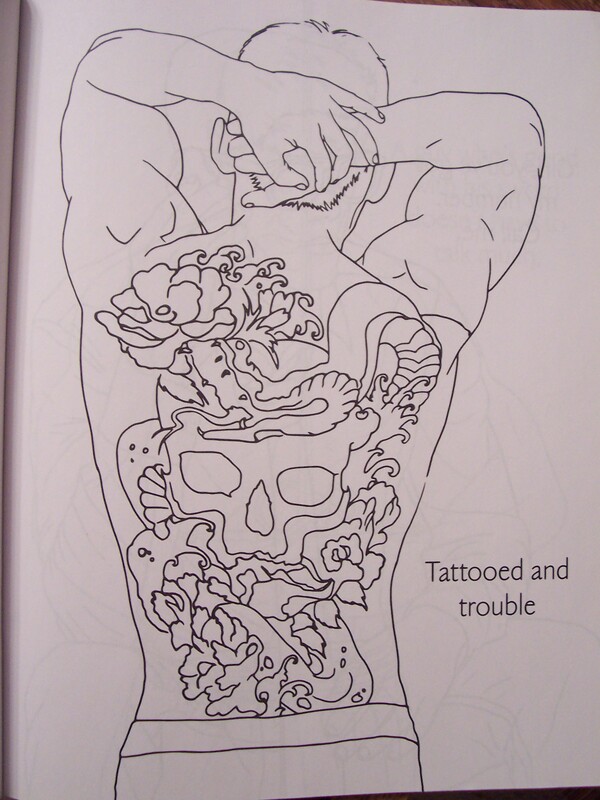 “Tattooed and trouble” is waiting for you. 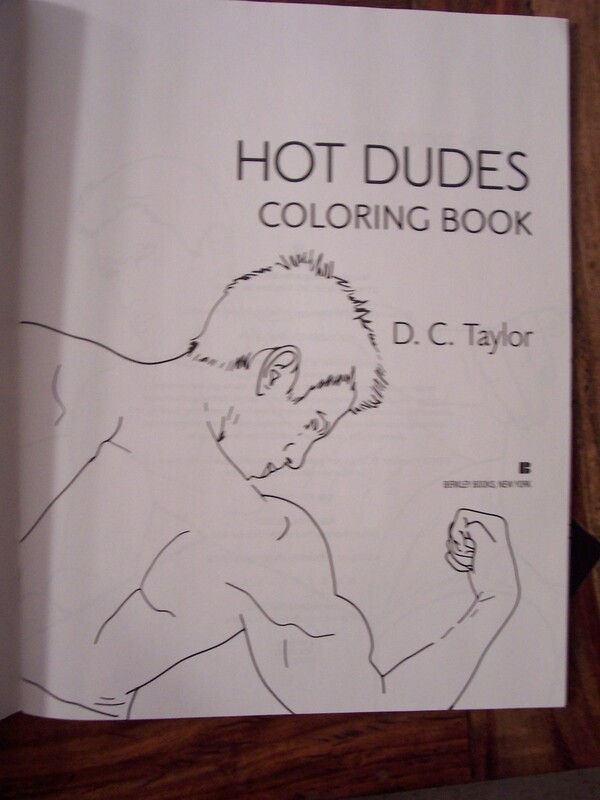 Just bring the crayons and the colored pencils and all that epic beefcake is yours. A big thanks to Blair for giving me the gift of some crazy for a whole solid weekend in May. I had a really great time. And we did a whole lot of planning together for our event this August. Which will be rad and will feature root beer. Because root beer. So if you’re going to be in southwest Colorado this August — please check out the Facebook page for the Writers and Scribblers Literary Retreat and come! We’d love to see you there!